Students of marketing understand that a truly successful product is one which fills a gap in the marketplace. Something which answers a question asked by thousands. When 356 production ended and was replaced in the market by the 911/912 pair, nearly everyone wanted to know when Porsche would again produce an open air version of their new sports coupe. Looking to meet this demand, dealer and importer Johnny Von Neumann teamed with Italian design house Bertone to create a drop-top Porsche. 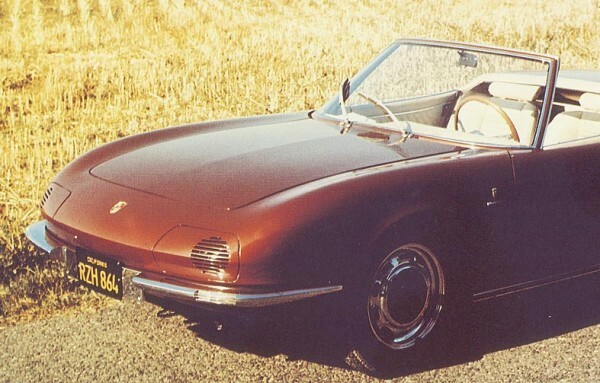 While Porsche was already in works developing the new-for-'66 911 Targa, Von Neumann felt this would not be enough for the fickle and volatile California market (who were pestering him for a roadster/speedster/spyder replacement of some kind). In speaking with Porsche about this problem, Von Neumann was approved for release of a single chassis. This 911 was to be sent to Bertone for engineering and installment, and was to be used as a litmus test. As Porsche's previous rebody work with Italian firms had left the corporate bigwigs with a bad taste in their mouth, they told Von Neumann that, as their name was on the car, they would have final say on production. The end result seemed something absolutely spectacular, with the new body looking much more fetching than anything that had come out of Porsche, or in fact Germany as a whole. The car was truly an Italian design, mimicking and improving on contemporary designs from competitors Lamborghini and Ferrari. Even the interior was "Italianized" with the standard gauges moved to the center stack, proper GT cruiser leather seats, the rear seat removed, and a legitimate center console added. 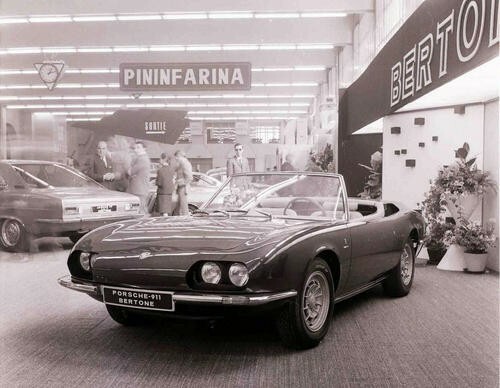 The agreement with Bertone was to produce a single chassis to test the feasibility of mass production for less than a showroom price of $8000 US Dollars. Once done, the car was prepared for the Geneva Auto Show, where it completely stole the stage. Against competition from Jaguar and the spectacular Lamborghini Miura, the Bertone special was seen as the most compelling. While there was a warm reception for the car in Geneva, and several inquiries, no one placed hard orders or gave any indication of actually purchasing one. The higher-ups at Porsche killed the deal, and Von Neumann was forced to concede that the Targa would be more practical for production at a much lower cost. Originally displayed with Campagnolo wheels, and in a particularly fetching shade of Carmine Red, the Bertone special wowed crowds. When originally produced the car used a standard 911 2.0 flat six, but with the introduction of the 911S, it received an upgrade to the S specification engine. Sometime during its life it has been reupholstered with a saddle color leather and has been repainted in a lovely smooth black that complements its curves. While it has received several different sets of wheels, notably, steel 904 wheels, and a wide set of Fuchs, the car is most often shown wearing a perfect set of 914-6 Mahle "Gas-burner" wheels. I first came in contact with the beautiful “Bertone Porsche” while working for John von Neumann at Competition Motors as Parts Manager in Hollywood, CA. John sold it to Morley Kasler who then gave it to Pete Kasler, his son. Pete moved down to the Newport Beach/Balboa Ca. area, where I was the Parts Manager for Chick Iverson VW-Porsche-Audi. Chick became aware that the Bertone was nearby and he knew both Morley & Pete Kasler. Chick made an offer on it and became the owner of the Bertone which needed a freshning up as he had been neglected over the years. Neil Emory, Don Emory & Bill Rhinehart took on the task. It was stripped down to bare metal and repainted a deep burgundy, leather redone by Bill Colgan and Porsche factory alloys installed. Chick owned the Bertone for many years then sold it to the President of BMW and it was shipped back east. I lost track of it then. Does anybody know where it is now? Thanks for the great provenance. Hopefully someone else will see your comment that knows what happened to it next. Do you know how long ago it was sold to the president of BMW? I don’t know for sure when, but it had to have been prior to December 1984, when I left Chick Iverson in Newport Beach to move to Reno, NV to work @ Porsche Cars North America. but you might try Gary Emory at Porsche Parts Obsolete. 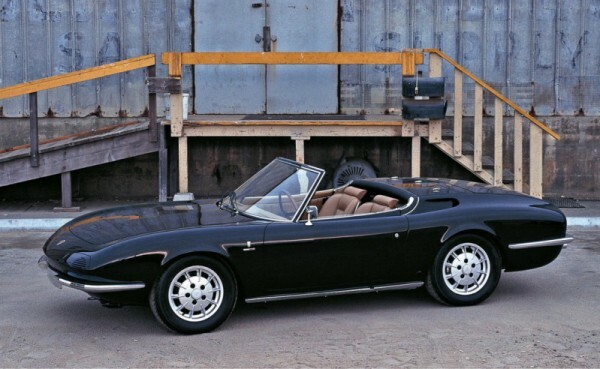 It looks a lot like an Alfa Spyder from the early ’70’s, even though that body work was by Pininfarina. Having owned a Spyder, and all of the problems attendant to that vehicle for several years, I would have to keep reminding myself that it was Porsche under the sheet metal everytime I looked at it. Beautiful car. I owned a ’66 912 that I bought in Germany in 1967 for $3,000. An $8,000 price tag would have been completely out of range for me at that time. I agree with Jim in Houston that this example looks oddly non-Porsche. The Stan Townes 911 Speedster of the same era was a one-off that better captured the spirit of an open-air Porsche in the 911. An interesting exhibit would be to gather some early interpretations of the 911 in an exhibit. This might be the year to do that, given that it is the 911’s 50th. Momentum can achieve amazing results… why not indulge all variants of the 911 for a year? General consensus seems to be that this example does not look all that Porsche-like. Although, you have to remember, this was at a time when Porsche had just shifted from the 356 to the 911. That is a huge shift when you look at the design of the two cars. With that being said, I doubt many people, consumer or designer, really had any idea of what the Porsche brand was in relation to design. Really, the only carry-over from 356 to 911 are the louvered trunk and round-ish headlights. I would like to know if the pictures of it when it was black are recent?I saw the car back when it was maroon. I was on the scene as an employee of Volkswagen of America when Chic Iverson acquired this car. He sold it to my old boss at VWoA (VP of Sales Jack Reilly) and had it shipped back east by rail. When Jack decided to sell the car he shipped it back to Chic (which was stipulated in their deal). This all happened in the time frame ’69 to ’73. The car was owned by Jack Reilly so the story about it being bought by the prez of BMW is not true. I have no knowledge of what happened to it after it was returned to California.